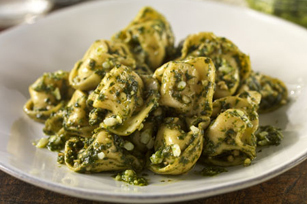 Make perfect Parmesan-Pesto Tortellini in just 20 minutes with the help of some ready-made pasta. Add garlic, basil and olive oil to complete this entrée. Cook tortellini as directed on package, omitting salt. Meanwhile, process basil, cheese and garlic in food processor until well blended. With motor running, gradually add oil through feed tube at top, processing until well blended. Drain tortellini; place in large bowl. Add pesto; mix lightly. Serve with a mixed green salad tossed with your favorite KRAFT Light Dressing. Prepare recipe as directed. Refrigerate up to 2 hours before serving. Place basil leaves between 2 or 3 layers of paper towels in resealable plastic bag; seal bag. Store in refrigerator. Rinse just before using.